Annual Spring Fundraiser, The Felta Fiesta, is right around the corner. Please consider joining us next Wednesday evening from 6:00 to 7:30 at the Felta School House to help with the planning of our Annual Spring Fundraiser, Felta Fiesta! We are holding this event on Saturday March 30th at the Krug Event Center in Healdsburg. This is sure to be a fun and exciting event! The Child Parent Institute is once again offering Parenting Advanced Learners classes starting Feb 5. The classes are appropriate for parents of children ages 4-18. Please see attached fliers for more information. A series of six discussion based classes. Raven and Chubby Pants, our West Side cats, will be making their official debut! Each student has participated in the creation of our chalk mural! Thank you Jessica Martin and the Felta Education Foundation for your sponsorship. We hope to you see there! Our three new girls! Thanks to Tiffany at Wise Acre Farms in Windsor. 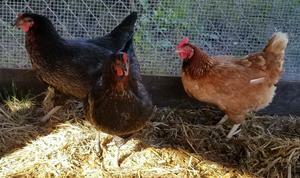 She donated three hens to the new West Side Chicken Fortress. Felta Education Foundation (FEF) helps to support and enrich the education of every child at West Side School through a community based effort. On Monday, November 26, Congressman Jared Huffman visited West Side School to learn about the school’s recognized student environmental programs. The Sonoma County Office of Education, Sonoma County Health Services and Sonoma County Districts, have agreed on a protocol for air quality-related school closures, to better inform staff and families about what to expect. Please continue to read letter and view matrix. Help us reach our goal of 600 cans for the Redwood Empire Food Bank. Gingerbread Doghouses, Kids Night, Animation, Movie Making, Cooking, Cartooning ...and more!